Generously proportioned backrest and seat. Stylish padded arms with silver detailing. Matching stitching detail to back and seat. Seat and back finished in soft PU. Fully reclining tilt mechanism and tension control. Seat height - 450 - 540mm. Comfort while working at a desk all day is very important, as it enables you to concentrate more on your work. Having a good supportive chair is the key to this as reduces absenteeism by ensuring your posture is correct throughout the day. Our high back leather effect executive chairs have generously proportioned backrests and seats with stylish padded arms that have silver detailing. 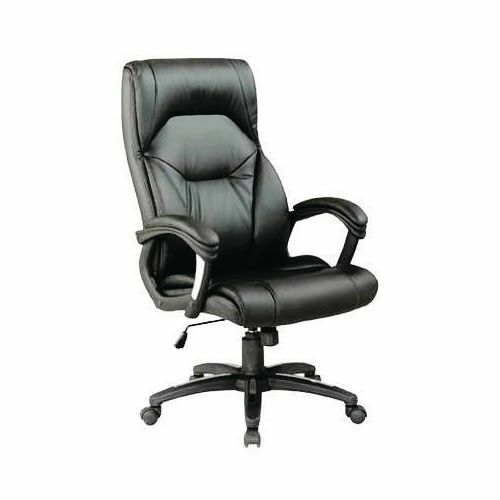 The seat and back are finished in soft PU; the chair also has a fully reclining tilt mechanism and tension control. They also have a heavy duty gas lift and a capacity of 25 stone, making it suitable for most users. These chairs will help you focus throughout the day with support for your posture and body, providing you with comfort and style. 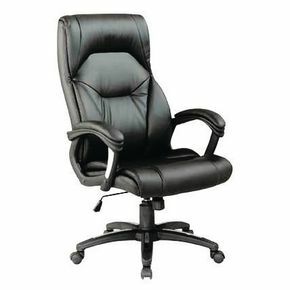 Our high back leather effect executive chair is a great chair for anyone who works at a desk all day. They give you support, which will help you focus throughout the day, increasing your productivity and they have FREE UK Delivery.